The green ribbon of Primorsky Boulevard meanders along one of Southern side’s most picturesque slopes, in the city’s historical part. 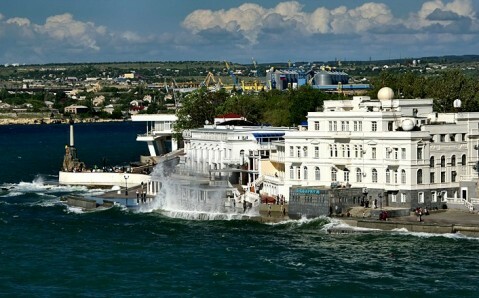 It has been the favorite walking and recreation place of Sevastopol’s locals and guests for almost a century and a half. 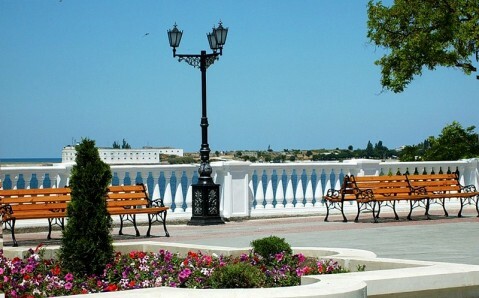 It is one of the city’s most beautiful green areas, which attracts not only with cozy lanes and observation areas, featuring amazing views of the Sevastopol Bay, but also with the whole complex of the very interesting monuments. 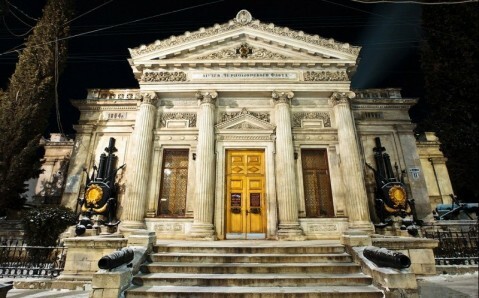 They serve as a history book and introduce glorious city’s tough past. 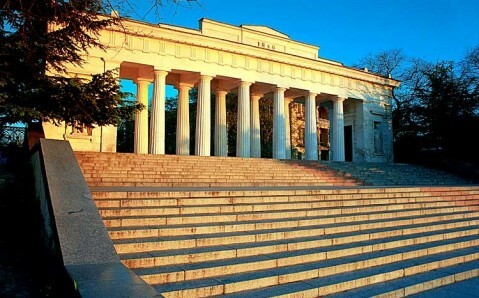 In the first half of the 19th century, the territory, which currently houses the Primorsky Boulevard, was occupied by the stone Nikolayevskaya Battery. It was aimed to protect the entrance to the Southern Bay. However, it was blown up by French during Crimean War, and then, barely passable ruins towered on its place for a long time. It wasn’t until 1883 that ravelin’s remnants were removed and the territory was cleared up. Two years later, the boulevard was founded: multitude of trees was planted, neat lanes were laid and walking areas overlooking the sea were created. Original building of the yacht-club was raised in boulevard’s western part. It was designed in the pseudo-Mauritanian style and had reading room and restaurant on the first floor. Soon, biological station that studied sea flora and fauna was built nearby and an aquarium was opened there. It still works and is considered to be one of the oldest public aquariums in Europe. Primorsky Boulevard’s modern look started to form in 1905. 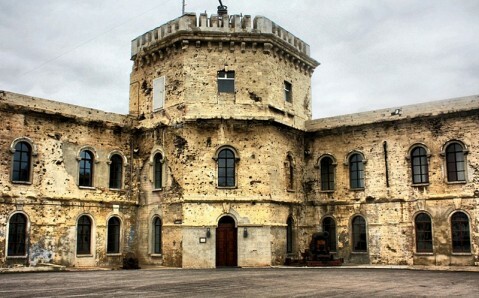 At that time, it was actively transformed during preparation to the 50-th anniversary of the First Defence of Sevastopol. A lane that linked the boulevard with the city quay was laid; ornamental breastwalls, stone benches, stairs and pedestrian arched bridge were built. It was then that the Primorsky Boulevard acquired its main attraction. The Monument to Sunken Ships was installed on the handmade granite rock, ten meters from the quay, in order to commemorate ships that selflessly blocked the entrance to the Sevastopol Bay during the Crimean War of 1853 – 1856 and held back the enemy fleet. Boulevard’s quay has a spot marked by stone wharf with staircase. It is there that the floating bridge began. City’s defenders used it in order to cross to the north side on the night of August 27 to 28, 1855. 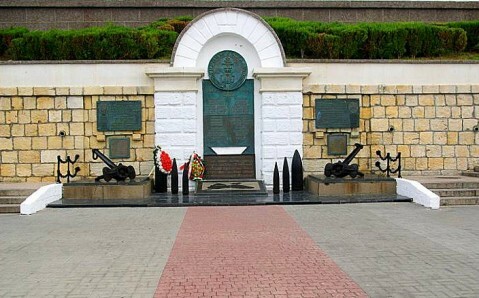 Other monuments that remind about city’s tough history are the Memorial Plaque, which commemorates the tragic story of the cruiser ‘Ochakov,’ and the memorial to the ships of the Black Sea fleet’s squadron: it is an architectural arch with three-meter-large cast bronze plate in the center. Names of twenty-eight ships that took part in battles against the German-fascist invaders during the Second World War are written on it. The Primorsky Boulevard transforms from year to year. It becomes greener and acquires new architectural details. 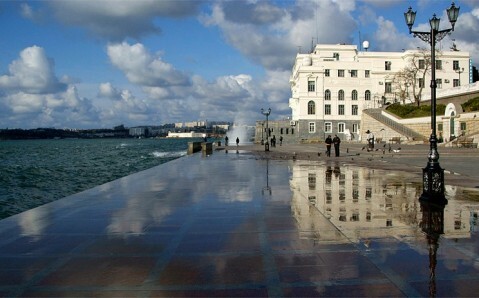 In this way it reaffirms its status of one of Sevastopol’s most beautiful and attractive areas. Шикарное место:)Всегда приятно здесь побывать! Широкий бульвар. Великолепный, легендарный, любимый! Чуть ли не самое красивое место во всем городе) Во всяком случае отсюда открывается великолепный вид на Севастопольскую бухту. Севастополь самый красивый город в Крыму, жутко не хватает фонарей и порядка на набережной, можно посрать на тротуаре и никто не заметит. Романтика. Моё самое любимое место в любимом городе русской славы! Жаль, что он по-тихоньку превращается в туристическую базу. Очень вкусное кофе предлагают девочки, что варят в джезве (турке) на песке! Обзорная экскурсия на катерочке "Юнкер" - супер!Дядька с хвостом очень интересно и подробно рассказывает.Понравилось! 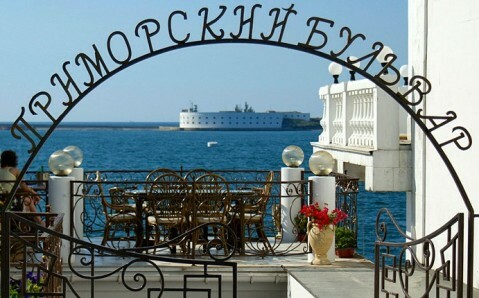 The place to be in the warm summer evenings- See the residents of Sevastopol taking a stroll along the Seafront, usually with live entertainment as well!! Вот как это потрясающе выглядит!